The CoolSculpting procedure eliminates stubborn fat safely and effectively, without surgery or downtime. This fat reduction treatment is the only FDA-cleared procedure to use controlled cooling to safely target and eliminate fat that diet and exercise can’t get rid of. CoolSculpting results are proven, noticeable, and lasting, so you’ll look and feel great from every angle. You can reshape your body with a customized CoolSculpting treatment plan that addresses your problem areas. Additional sessions may further enhance your results. Dr. Kearney and his staff will prepare a custom treatment plan that will be tailored to your body, your goals, and your budget. It’s easy to sit back, relax and say goodbye to stubborn fat. After we select what areas are to be treated, the device is positioned on your body and controlled cooling is applied. During your procedure, you may choose to read, check email, or even take a nap. Are you ready to love every view of you? The sooner you set up your consultation with Dr. Kearney in San Diego or La Jolla, the sooner you’ll see results in the mirror—long-term results in those areas that have resisted all efforts through diet and exercise. 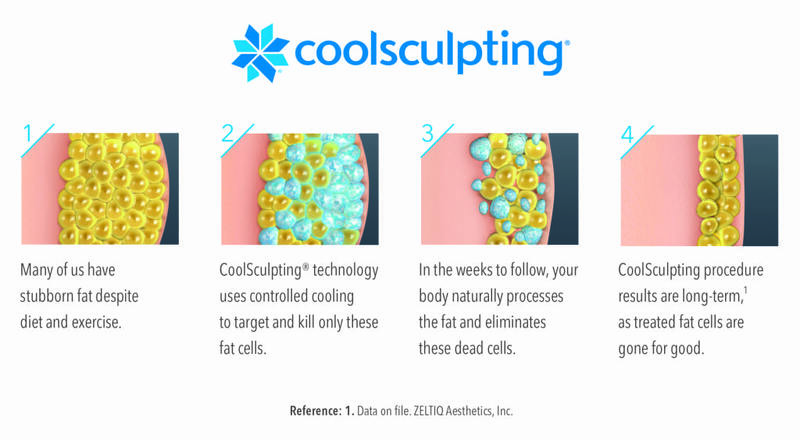 Contact us at 858-677-9352 to find out if the CoolSculpting fat freezing procedure is right for you. ANSWER: You may be a good candidate if you have noticeable bulges of fat in certain areas that you’d like to get rid of. The procedure is specifically designed for people who have unwanted fat that is resistant to diet and exercise. CoolSculpting is not a surgery or weight loss solution for people who are obese or who have an excess amount of loose skin. It is, however, a non-surgical alternative to traditional liposuction that works very well for people who are at, or close to, their ideal weight. Request a one-on-one consultation in La Jolla with us to determine if the CoolSculpting procedure could work for you. How much does CoolSculpting cost in San Diego? ANSWER: The price for CoolSculpting varies depending on how many areas of concern you have, the number of sessions needed, and what your overall body shaping goals are. We will help create a customized treatment plan when you come in for a complimentary consultation that’s tailored to your body, your budget, and your goals. How long is each session of CoolSculpting and how many sessions will I need? ANSWER: The length of your CoolSculpting session at our La Jolla office depends upon how many areas you are treating. Some patients are here for only a couple of hours while others may spend a longer amount of time with us, depending on how many sessions they choose to receive. Many patients are able to work on their laptops or smartphones during their session so there is a limited interruption to their workday. We will help you create an individualized treatment plan tailored to your specific needs. Some patients may choose to schedule additional sessions, depending upon their goals, but most are happy with their results after just one session to the area they are treating. Where does the fat go and are CoolSculpting results permanent? ANSWER: Once the treated fat cells are crystallized (frozen), your body will begin to metabolize the fat and eliminate those dead cells through a natural process of waste. Just like with traditional liposuction, once the treated fat cells are gone they are gone for good with CoolSculpting. ANSWER: A cool gel pad is put over the area being treated and an applicator is put on top which suctions onto the body and pulls the fat up inside. You will initially feel pressure and an intense cold during the first few minutes of the process but this soon dissipates. Most people who have CoolSculpting done in our La Jolla office simply read, watch TV, work on their laptop, or even take a nap during their treatment. ANSWER: Yes. CoolSculpting is the only FDA-cleared procedure to use controlled cooling to safely and effectively target and eliminate fat that is resistant to diet and exercise. It is safely used on the flanks (love handles), inner and outer thighs, and upper and lower abdomen – the places where most people tend to carry excess fat. With over one million CoolSculpting treatments performed worldwide, it is a very safe and proven treatment for non-surgical fat reduction. ANSWER: Common side effects immediately following the procedure can include swelling, bruising, redness, firmness, temporary numbness, stinging and soreness. Most of these resolve within 1-2 weeks. During the procedure in our La Jolla office, you may feel some deep pulling, tugging, pinching or mild discomfort as the applicator is working. People who suffer from Cryoglobulinemia or Paroxysmal Cold Hemoglobinuria should not have the CoolSculpting procedure done. As with any procedure, a proper medical consultation and evaluation must be done prior to treatment in order to determine if it’s right for you. Rare side effects can occur which we will discuss during the consultation and evaluation visit. ANSWER: Yes, you can return to normal activities immediately following treatment. The CoolSculpting procedure is completely non-surgical with no anesthesia or pain medication required. Most patients will return to work or even hit the gym after they complete their CoolSculpting sessions in our San Diego office. ANSWER: Some patients report that they start to notice changes as soon as three weeks after treatment, but most see the most dramatic results right around the two to three-month mark. Your body will continue to flush out fat cells for up to four to six months after treatment. Do I need to take special supplements or follow a strict diet and exercise program in order to do CoolSculpting? ANSWER: No supplements, pills, or specific diet and exercise habits are required. The best candidates for CoolSculpting are the ones who already have positive diet and exercise habits but still find themselves with areas of stubborn fat. Many patients feel more motivated to take care of themselves after their CoolSculpting treatment as they start to see their results. What happens if I gain weight down the road after treatment? ANSWER: Most people, upon seeing the results from their CoolSculpting procedure, take even better care of themselves after the treatment. However, if you do gain weight, you will gain it evenly all over your body, not just in the treated areas. The fat cells that are frozen are permanently removed but the ones that remain can expand if you don’t take care of yourself. What do I do to prepare for a CoolSculpting session? There really isn’t any preparation necessary. But a couple things are advised. You should avoid taking any medications or supplements that can thin your blood because this makes you more susceptible to bruising. Not that you can plan for it, but the skin on the treatment area should not have a cut, sore, or other damage. This is because your skin will be suctioned onto the CoolSculpting applicators during treatment and this could cause a cut to open up. Avoid tanning the treatment areas for a couple weeks prior to your session, as this can make the skin on those areas more sensitive. CoolSculpting is the original non-invasive fat reduction procedure and its results are thoroughly proven. During a CoolSculpting session, up to 25 percent of the fat in the treatment area is removed. This fat is permanently gone. CoolSculpting is the world’s most popular non-surgical fat reduction procedure for a simple reason — it works! Can CoolSculpting shrink my double chin? Yes, at Dr. Kearney’s we offer the CoolMini, a smaller applicator that was created specifically for smaller areas, such as the jowls. Can CoolSculpting reduce fat anywhere on my body? How is CoolSculpting different than other fat reduction procedures? How is it better? CoolSculpting was the first non-invasive fat reduction procedure and still is the only procedure that uses controlled cooling to kill the fat cells. You may have heard of Vanquish and SculpSure, two newer options for non-invasive fat reduction. Dr. Kearney believes CoolSculpting is the superior option. Here’s why. Vanquish uses radiofrequency energy to heat and destroy fat cells. The cells are then cleared by the body’s lymphatic system, just as with CoolSculpting. The results are similar, both removing from 20-25 percent of the fat in the treatment areas. CoolSculpting applicators come in contact with your skin, while Vanquish is a larger device that the patient lies under. The Vanquish device wraps around the entire abdomen.This is an advantage for CoolSculpting, as it has the ability to treat much smaller areas, such as the jowls or bra line fat. Vanquish cannot adapt to smaller areas. Also, because of its use of radiofrequency energy, patients with any metal in their bodies between their neck and knees cannot have the procedure. This includes copper IUDs; knee, hip, and shoulder replacements; spinal fusion rods and hardware, and pacemakers. Like Vanquish, SculpSure uses heat to kill fat cells. SculpSure’s vehicle is laser energy. SculpSure uses four applicators that can be lined up or stacked to deliver the laser energy.Like Vanquish (although more flexible in its options) SculpSure cannot adapt to smaller areas in the same way as CoolSculpting. SculpSure is currently FDA-approved to treat the stomach, love handles, back, thighs, and double chin. This is a surgery vs. non-invasive question. Yes, liposuction can directly remove the unwanted fat in the target area, but it requires an incision (albeit it rather tiny these days) and some recovery time. Liposuction is a very popular procedure and very effective, but it is still a surgical procedure with anesthesia and recovery. Is there a reason not to have CoolSculpting done? All you have to lose is unwanted fat. There could be a reason to not have CoolSculpting, but we can’t think of one. Dr. Robert Kearney offers CoolSculpting to patients in San Diego and La Jolla, CA. Call (800) 671-1951 or fill out a Contact Form here to schedule a consultation!